Christmas Eve supper in Ukraine and Russia. Only kompot, kutia, borscht, herring, varenyky and salt are shown. A twelve-dish Christmas Eve supper is traditionally prepared in many Central European and Northern European cultures, especially those that were formerly part of the Polish-Lithuanian Commonwealth, including Polish, Lithuanian, Russian, Ukrainian and Belarusian. The meal (Belarusian: куцьця, Lithuanian: kūčios, Polish: wigilia, or wieczerza wigilijna, Russian: святая вечеря, Ukrainian: Свята вечеря, Sviata vecheria) consists of twelve meatless dishes representing the twelve months of the year. The tradition of the supper can be traced back to pre-Christian times and connected with remembrance of the souls of deceased ancestors. In some parts of Poland a similar tradition of thirteen meatless dishes on Christmas Eve is practiced. The specific dishes may differ from country to country, but many of them are universal. Due to the Nativity Fast, no meat, eggs or milk (including cheese) are allowed during the supper. Thus fish, mushrooms and various types of grain are the main offerings. In Poland the supper begins with eating soup. The ritual in Ukraine is to start Sviata Vecheria with Kutia. 'Kutia', poppy milk (aguonų pienas) together with kūčiukai are served as a dessert and forms a significant part of the Lithuanian Christmas Eve menu. Poppy seeds are widely used for Christmas Eve dishes, because they symbolise abundance and prosperity. In this respect, it was believed that varenyky, which are also a symbol of prosperity, with poppy-seed filling when served at Ukrainian Sviata Vecheria have the most magical potential for bringing prosperity and fecundity to the villager. Regarding the fish dishes, these are usually herring, carp or pike. In Lithuania, herring (Lithuanian: silkė) dishes are popular and diverse. Usually silkė su morkomis (herring with carrots), or silkė su grybais (herring with mushrooms) are served on Christmas Eve. Mushrooms, especially dried or pickled, are also one of the main ingredients used in Christmas Eve dishes. Sauerkraut (Polish: kiszona kapusta, Ukrainian: квaшена капуста or "кисла капуста", kváshena kapústa or kisla kapústa) with wild mushrooms or peas, red borscht, mushroom or fish soups are served in Poland and Ukraine. Boiled or deep fried dumplings (Polish: pierogi, Russian/Ukrainian: вареники, vareniki or varenyky, Lithuanian: auselės) with a wide variety of fillings (including cabbage or sauerkraut, mushrooms and crushed poppy seeds), are among the most popular dishes. Doughnuts filled with jam (Polish:pączki, Ukrainian: пампушки, pampushky) are served for dessert in Poland and Ukraine, but in Lithuania sweet dishes are not common, as they are believed to be inappropriate for the solemn atmosphere of the evening. 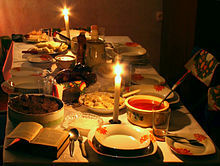 Traditional Ukrainian Sviata vecheria meal. Jacques Hnizdovsky Christmas card. As for beverages, traditionally dried fruit kompot or cranberry kisiel (Lithuanian: spanguolių kisielius) are common. In earlier times oaten kisiel was more common. There is the whole ritual before the meal begins. Once the first star appears on the sky, each member of the family washes his face, hands and legs in cold water saying: "Be as healthy as this water is." The most brave people go to local rivers or lakes and have a short swim there. After the water procedure is finished, the family goes on with a prayer, often the Our Father. After the prayer the head of the household will anoint each person present with honey, making the sign of the Cross on their forehead, saying: "In the name of the Father and of the Son and of the Holy Spirit: may you have sweetness and many good things in life and in the new year." The Christmas Eve supper is usually held under candlelight and starts in the evening after the first star appears in the sky. The star symbolizes the birth of Jesus in Christian tradition and a soul of deceased ancestors in pre-Christian beliefs. Quiet, dim-lighting, and a somewhat mystical atmosphere is characteristic for Christmas Eve supper. In Poland, Russia and Ukraine an extra plate and seat are always left at the table. According to the folk believes the spirits of the departed members of the family visit on the night. It is also very customary to be even more hospitable and invite unexpected visitors to the supper. This page was last edited on 28 December 2018, at 17:45 (UTC).